Part of my new found love of farmhouse style has also been falling in love with pottery pieces by Rae Dunn. 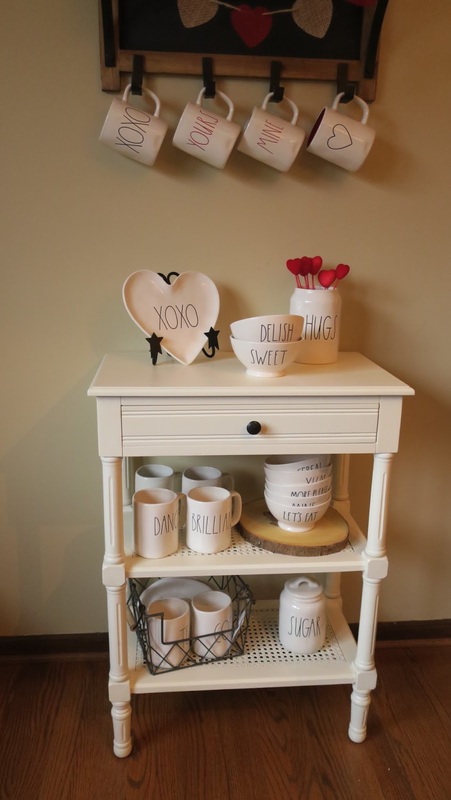 These adorable pieces, most notably her large writing mugs and canisters, are signature pieces found in a lot of modern farmhouse styled homes and something that I gravitated towards after seeing them in numerous Instagram posts! They can be found in the US at sister stores HomeGoods, Marshall’s, and TJMaxx, which are all owned by the same parent company. The prices are very reasonable, ranging from $3.99-$14.99 per piece, mugs in the starting range of $3.99 and larger pieces like serving platers or large canisters at higher price points. However if you’re familiar with shopping at these stores, you know that it can be quite hit or miss with what they have in their inventory and if you see something you like, you NEED to grab it – because it may not be there when you go back! And so… the hunt for Rae Dunn was on! I’m lucky enough to live in an area that has a TON of these stores. A number of HomeGoods stores, and numerous Marshall’s with a HomeGoods area in them, along with many TJ Maxx locations. A large number of them are within close enough proximity to check 5-10 stores within a few hours time, if you have the time to devote to hunting… so as I started keeping an eye out for Rae Dunn pieces, I found that I had incredible luck finding things at a number of the stores. Current Rae Dunn display after a bit of hunting! After a month’s time, I have ended up with an entire display area of Rae Dunn and I’ve slowed my search and started helping find things for other people on their wish lists. I know how incredibly hard it has been for some people to find things, so I’ll put together some tips for Rae Dunn hunting in a future post, that have at least worked in my area. For now, I’m pretty happy with all of the pieces I’ve found, and the main outstanding pieces that I would love to find are the TEA teapot, TEA canister, and perhaps one more decorative canister. Other than that, I really can just be on the hunt for other people! Some surprise finds I came across! My husband is a great sport, but mentioned along the way while I started collecting these that he didn’t really “get” the writing on them, and it became a running joke in our house. One morning he decided to prank me by labeling everything in our kitchen, check out my reaction here! All in good fun, it has been a great time hunting for Rae Dunn pieces and I’m enjoying transitioning our home from a more traditional style decor to incorporating more farmhouse style pieces. If I can annoy my husband a little in the process, well that is just a little added bonus!